July | 2013 | Mom of Tornado - The realization of the last 30 something yrs. Measuments: 2 cups of flour ¼ cup of baby oil – what I did was for every two cups I added the baby oil . I eventually made 6 cups of flour and ¾ cups of oil. But once I was mixing I added a bit more oil as needed. Use your judgement. As a working single mom I am always trying to find inexpensive ways to keep my kiddo entertained. The weekends are filled with fun outings and time spent running thru sprinklers but when Monday comes along it’s a bit hard to convice your 3 yr old that at 6pm when you come home you don’t want to fill a kiddie pool or go running in the park. But you don’t want them to just zone out in front of the TV. After pinning a bunch of DIY projects I decided it was time I actually roll up my sleeves and dig in. One that caught my eye was Cloud Dough. 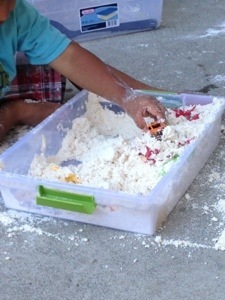 Very safe for the preschooler to play with and super easy to make. Cloud dough is essentially flour mixed with baby oil. My kiddo was eager to help me make it and get his hands in there. Once we got it all mixed up we dropped some cars and plastic dinousours and mixed them in. The dough can be formed into hills and smashed and held its shape just fine. 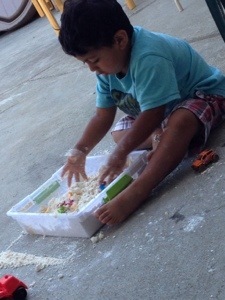 He loved getting his fingers inside the dough, burying his toys and digging them out. 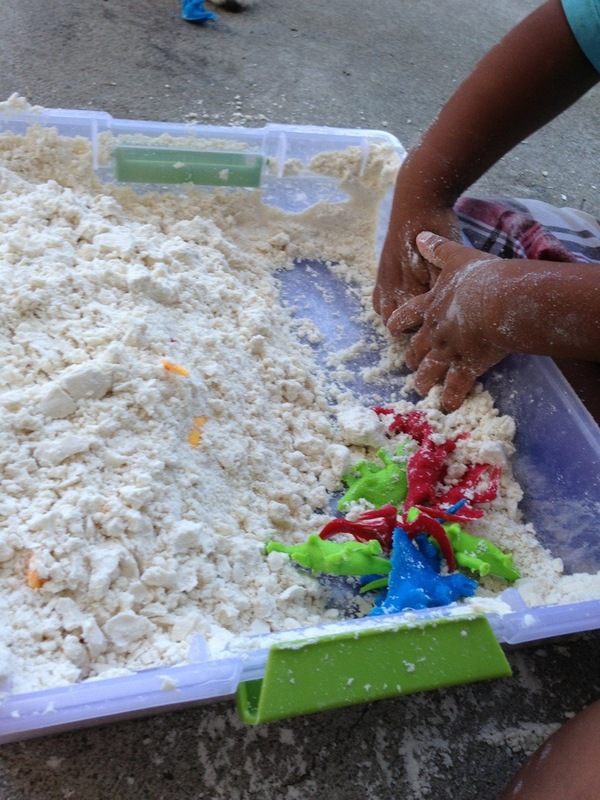 It can get a bit messy so I would suggest this be an out door activity. He did get this everywhere even in his hair but he was entertained and that to me is what matters. It did take quiet a bit of sweeping to pick up the dough that made it onto the patio. I would not pour water on it since it can become a paste. I’m not 100% on storage of the cloud dough so I ll give you an update on how it goes. I stored it in a plastc bin and left it outside. I might have to move it out of the heat so it does not harden in the plastic bin to a cooler place like the garage. 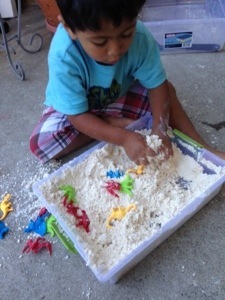 Let me know if you have tried this or any other DIY project that kept the kiddos entertained. Leave me a comment, follow my blog and or follow me on twitter.